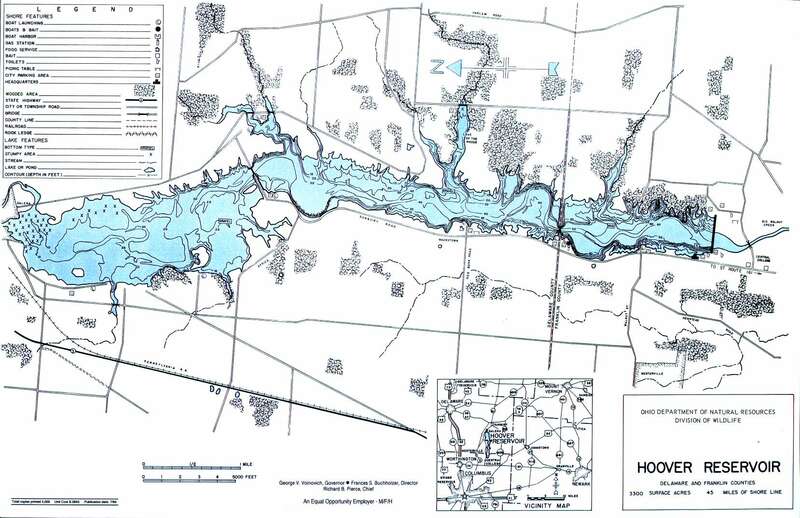 Hoover Reservoir is a 3000+ acre lake located just east of Westerville, Ohio. As the lake has a 10hp limit, it provides a safe environment for a multitude of sailboats, kayaks and more. Near the lake's southern edge, a multitude of launch areas are available along the west shore (along Sunbury Road) including several small parks between Maxtown and Central College roads. Several boat ramps are also available, although there is typically heavy usage in mid-summer due to fishing. Various inlets are available to adventure along almost the entire lake's eastern edge. Farther to the north, the lake gets more remote including a boardwalk geared toward bird watching near the lake's inception in Galena. There are several clubs which regularly use the lake for events including sailboats and crew teams so be cognizant of what's going on around you. It's nice not to be constantly watching for speedboats, but the sailboats can be sneaky fast, especially on those windy days. No known permanent restrooms are available. Port-a-pots can be found at various parks along the lake (Hoover Reservoir park @ South end, Boardwalk @ Galena to North). Sunbury Road runs parallel with the southern edge of the lake. Take 270 to 161E (toward New Albany) to Sunbury Rd exit. Go approx 3-4 miles north and the lake is on the right.